High-torque exhaust in a subtle design. Provides considerably more top speed. 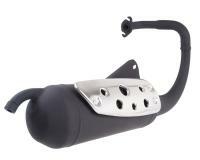 For those who want a new silencer and want more power but do not want to ride with a small and particularly sporty sounding exhaust on their scooter. Very good torque curve and excellent performance on 50cc and 70cc sport cylinders. Fits on all Peugeot models with vertical cylinders up to 1998. Please note the year of Peugeot models. The Silent Pro is available in 2 versions: Up to 1998, and built from 1998 on. The difference lies in the attachment to the engine block. Please note the pictures.